A graduate of Pennsylvania State University with a degree in hospitality, restaurant & institutional management with additional training from Les Roches School of Hotel Management in Bluche, Switzerland, Kris Reinhard joined the Fifth Group team as a kitchen manager with the opening of South City Kitchen Midtown in 1993. With Reinhard’s promotion to general manager of Bold Catering & Design, he joined co-founders Steve Simon and Robby Kukler as a partner in Fifth Group Restaurants. The trio has since opened eight more restaurants in the Atlanta area: South City Kitchen locations in Vinings, Buckhead and Alpharetta, Ecco, La Tavola Trattoria, Lure, Alma Cocina and The Original El Taco. In 2002, Reinhard was honored as one of the Penn State Hotel and Restaurant Society’s Emerging Professionals. Under his leadership, Bold Catering & Design has received numerous awards, including the 2017 Catersource Achievement in Catering Excellence (ACE), “Best Chef” at the Modern Luxury Weddings inaugural Diamond Awards and 25 Allie Awards. 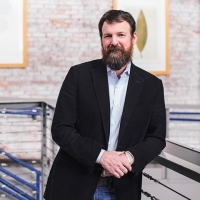 An active member of the community, Reinhard currently serves as a board member of the Atlanta Convention and Visitors Bureau and has also served as a board member of the Virginia-Highland Civic Association and the Virginia-Highland Business Association. Originally from Chagrin Falls, Ohio, he currently resides in Dunwoody with his wife, Suzanne, and their three children. In his spare time, Reinhard enjoys instructing and competing in auto racing.